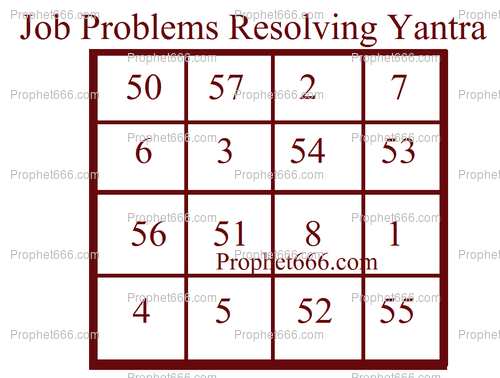 This simple and easy to make Yantra is a workplace related problems resolution Charm. The Yantra does not have any corresponding Mantra or Tantra Experiment and hence is most suitable for anyone having any problems or troubles relating to the job, employment and workplace [Naukri Aur Kaam Kaaj Ke Bare Me Samasya] to practice. The simplified Yantra making procedure is explained below in this post. The Yantra should be prepared on any Friday in the morning. It should be written on a clean and pure white piece of paper with a mixture of the paste of Ashtagandha and Kesar [saffron strands]. A few drops of water and a few strands of Saffron should be added to Ashtagandha in order to prepare the ink. A Pomegranate tree [Anaar Kalam] twig should used to draw the Yantra. Then the Yantra should be put in Melted Wax [ Mom मोम in Hindi] and then removed from the Wax and when it dries up, folded and then inserted in a Cloth Tabeez[Cloth Locket] and tied around the right arm, either on the wrist or upper arm like a good luck bring Charm. The Yantra is said to remove job related problems and difficulties like workplace gossip, politics.groupism, false allegations, enmity, love problems and trouble, non-cooperation and harassment from co-workers, competitors, the boss and other superiors and from junior colleagues. You mentioned that i helps in love problems, how it is related to workplace? Love problems in the context of this Yantra means resolving fights, disagreements and difficulties arising out of love problems, like two person fighting over the same desired lover. You can practice any of the remedies, Totke, Yantra and Mantra experiments to find a job or reasonable employment, which are published on this site. How to bind bad spirits after exorcising them. Many people are able to remove them but they return. Is there ritual/mantra for this purpose. Sir, can we put this yantra in wallet and carry when I go out and office, or should this mandatorily be tied to the right hand ? The information given in the article is what is recommended in this Tantra. However, there if unable to use a Tabeez, then you can use the Yantra by keeping it in your wallet abd see if it helps you resolve your job issues. Dear Guruji, Please can I use another type of writing instrument. Pomegranate trees do not grow here. Would a normal wooden stick be okay. Pomegranate stick is the writing instrument mentioned in the Tantra for drawing this Yantra, it is easily available in most places, difficult to say if the experiment will succeed with any other instrument.